We are still conducting repairs to the complex from damage inflicted by Hurricane Michael. I am offering 20% off for April and May. These discounts are reflected in your quote. Contact me before booking, to discuss your stay. Relax in my beautiful one bedroom/one bath ocean front condo. The beaches are gorgeous, the Sunbird has many amenities and my unit has been totally renovated and is tastefully decorated. You can view spectacular sunsets right from the private balcony! The Sunbird is located in the middle of the beach and so, is convenient to everything. World famous Pineapple Willy's is next door with excellent lunch, outside dining on their pier, a varied dinner menu and drinks from the bar. I provide all linens and the kitchen is fully equipped. Just bring a beach towel and your tooth brush! I bought this property when the kids were young so we'd have some great family memories at this beautiful beach. Well, we continue to have memories here and I hope you do too! My condo is right in the middle of one of the most beautiful beaches in the world! The beach, ocean and sunset views are stunning. You are within walking distance to shopping, restaurants, family amusement and more. Beach front! Can see fantastic sunsets out over the ocean. Looking out the back, you can see the Signal Hill Golf Course. Full central heat for those rare cold winter nights. All bed and bath linens provided. Includes the sleeper sofa and blankets. Coin operated laundromat on the first floor of each tower. Strong in-room wifi provided free. Full fitness room included on site. Living room includes full queen sleeper sofa, love seat, coffee table, side table, 2 bar stools, stereo-CD player, HD cable TV with HBO and DVD player. Full refrigerator/freezer with ice maker. Full glass top stove with oven and lower storage. Full bagel sized double toaster. Full set of dishes and utensils. The dining table is just off the kitchen in the living/dining room. Comfortably seats 4 and has a view of the ocean. The kitchen also has a breakfast bar and stools. Comcast cable HD TV with HBO. Small collection of books and magazines. Nice ocean front balcony off the living room. Kayaks available for rent right on the beach. The unit has a deck off of the living room. The Sunbird has a huge deck surrounding the entire ocean side of the property. Jet skis, snorkel gear, para sailing are all available right on the beach. Many gold courses in the area and one is within walking distance. 3 pools. The west pool is heated October to April. Out standing location,price wall being repaired in bedroom. Had outside light shining very bright in to room but understanding hurricane had recently came through area is minor. Cost was very reasonable. Defently will return. The condo was great, perfect size for two people and very comfortable. Very clean and the view was perfect. We are use to having a washer and dryer in the room which we did miss but there is laundry facility on the ground which as nice also. 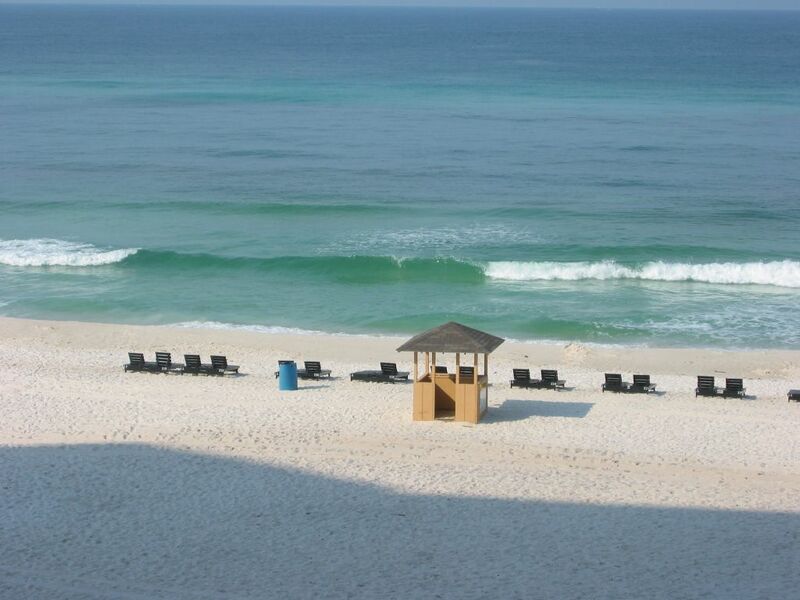 Furniture well maintained and "in -line" with beach properties. Bathroom sink could use drain cleaning as it runs verrrrrrrrrrrrrrrry slowwwwwwwwwwwwly. Bathroom in general needs some proper cleaning. I dropped comb under sink and found two old dirty wash clothes. Rugs in bath seemed to need replacing. Bed is too high. We had to go to Walmart and purchase a stool for wife (only $10 and we will use it again when we travel as we have the same problem 90% of the time in hotels and/or motels, etc). I was barely able to get in without jumping. But, aside from all these problems we really did enjoy the condo and the amenities of the complex. Owner also gave us names of some nearby restaurants that were great. Wife would like real cotton sheets on bed instead of that micro-fiber stuff that is slippery. Again, and in closing, we think this condo was comfortable and convenient. My husband and I loved our vacation to PCB! Great view of the gulf! We will definitely stay here again our next trip to Panama City! We loved our stay here. The only complaint we had was we had 4 adults that came and the pull out bed was horrible. There was no way anyone could have slept on it, the mattress was old and didnt have any support left. But its perfect for 2. The condo was clean and in a great location. I loved the granite countertops! And theres 2 entrances to the bathroom so that was awesome for us as well. If its just me and my husband we would definitely rent here again! I am so happy you had a great time. Sorry about the sleeper sofa. I will have that looked at/replaced right away. The Sunbird has three pools (one heated), huge sunning deck, workout facility, tennis court, volleyball court and shuffleboard. Cabana, jet ski rentals, banana boats, kayaks and boating adventures are available right on the beach. courses in the area. There is also a Super Wal-Mart within walking distance. The new Pier Park has shopping, dining, a theater and concerts. Other attractions include boating, fishing, scuba diving, snorkeling, family amusement parks, putt-putt, go-carts, Gulf World, The Miracle Strip, a zoo, Ripley's Believe it or Not, St. Andrews State Park, Ship Wreck Island Water Park, helicopter rides, para-sailing, shopping, cinemas, restaurants, night clubs, Panama City Mall and a dog track. I normally require a Saturday to Saturday stay in the summer. Check-in is 4:00 pm CST. Check-out is 10:00 am CST.